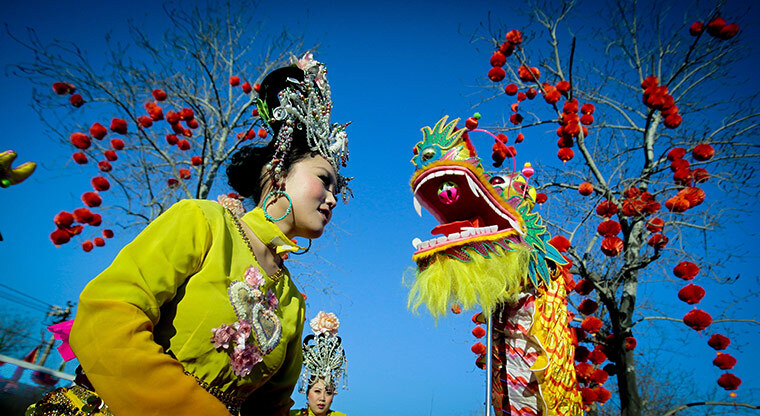 The Chinese New Year is symbolized by a new animal zodiac, determined by a 12-year cycle. Last year was the Year of the Rabbit. But 2012 welcomes a more commanding beast — the Dragon. The Dragon is anything but a formidable foe in Chinese culture. Unlike the demon that gets slayed in Western literature, the Dragon is a symbol of good fortune and intense power in Eastern culture. In Chinese tradition, the Dragon is regarded as a divine beast. According to Sung dynasty manuscripts, the Dragon is described as having the “head of an ox or donkey, eyes of a shrimp, horns of a deer, body of a serpent covered with fish scales, and a feet of a phoenix,” and it usually clutches a pearl, meant to symbolize its supernatural powers. The Year of the Dragon is one of the most revered years of the Chinese New Year calendar, and those born under the sign are regarded as innovative, passionate people who are colorful, confident and fearless. The Manila Bulletin cites that the Dragon is sometimes called a “karmic sign.” The Dragon is larger than life and its appearance means that big things are to come. The Year of the Dragon is a flowing river, not a stagnant lake, so things happen quickly earlier in the year. The Dragon marks progression, perseverance and auspiciousness. It may also bring about unpredictable events.